…or, that’s just the lame-o rationalization for the fact that we just couldn’t pass up meeting some real-life movie stars and a big-time director. C’mon, you’d have gone for it too. Smack dab in the middle of the afore-mentioned intersection is one of our favorite technical/artistic accomplishments: the long-track, unbroken cinema sequence, a masterful recent example of which was in the Academy Award winning film “Atonement”, directed by Joe Wright, who also directed such acclaimed films as “Pride and Prejudice” and “The Soloist”. [CUT TO PRESENT] So what you probably want to know now is: what’s the film? who are the stars? are there any awesome Steadicam sequences like Dunkirk in Atonement? 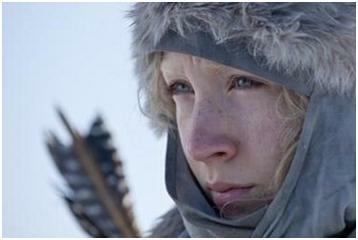 The new film is “Hanna”, set for release by Focus Features next April, an adventure thriller about a teenage assassin raised and trained by her ex-CIA father in the isolation of the wilds of Finland, until she’s ready to go off the chain, tracking her prey across Europe with the sleek, efficient ruthlessness of a tiger shark. Starring in the title role is the amazing young Irish actress, Saorise Ronin, who has already racked up nominations for an Academy Award (for her role in Atonement), and multiple BAFTA and Golden Globe nominations (for her roles in Peter Jackson’s film The Lovely Bones, and in Atonement). The role of her father is played by veteran actor Eric Bana (The Hulk, Troy, Star Trek, Funny People…); and Hanna’s equally ruthless CIA operative quarry is played by award-winning actress Cate Blanchett (Elizabeth, The Aviator, and many more). And, yes, Wright tells us, there are several long-sequence Steadicam shots, one of which is longer than the Dunkirk sequence and culminates in a fight scene with Bana’s character. The fight scenes themselves are a bit of a technical accomplishment. They were choreographed by Jeff Imada, whose previous credits include the two Bourne sequels. We asked Miss Ronin if having an actor father in real life (Paul Burch) helped her get into the father/daughter character role. “It’s been great growing up with an actor in the house. I guess I have performer’s blood. Dad helps with all my audition tapes – it’s like having a manager in the house. Plus, he has a Black Belt in karate, and was an all-Ireland Champion one year.” Apparently, poor Eric never stood a chance. The two clips we saw were solid, hard-hitting crowd-pleasers. Okay, so we were a bit star-struck. But this combination of acclaimed acting talent, movie-star looks, top-flight directing, and high-tech photography leads us to expect this film will be (you guessed it) a real killer.